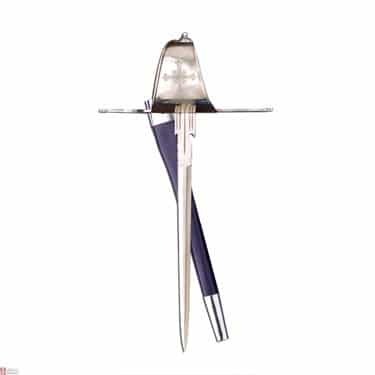 Matching gauche for the Musketeer rapier. Carried at the back for a left hand draw. Often brought into play with the rapier for a two handed fighting style. The 43cm blade has cutouts and notches to slow or disrupt the opponents blade. The hand is well protected by the knuckle bow. Comes with leather covered scabbard and steel parts.